We wandered over to the Kamloops Farmers Market, a whole block devoted to produce — huge bags of carrots, heaps of squash, greens still damp with the morning, baskets of garlic with origins in Russia, Hungary, Italy, apples of every kind — and artisan cheeses, breads, sausages, and woolen things made from local sheep. Wine from the local Harper’s Trail — we tasted, then bought, a few bottles of their Cabernet Franc and Field Blend White. And a table of the most wonderful bijoux made from old silver cutlery. I have a bracelet bought in London, a silver fork which a fellow cunningly fashioned around my wrist. But these pieces, by Alyse Kirsten, are different. Parts of the flatwear are shaped, wound into rings or linked into bracelets. 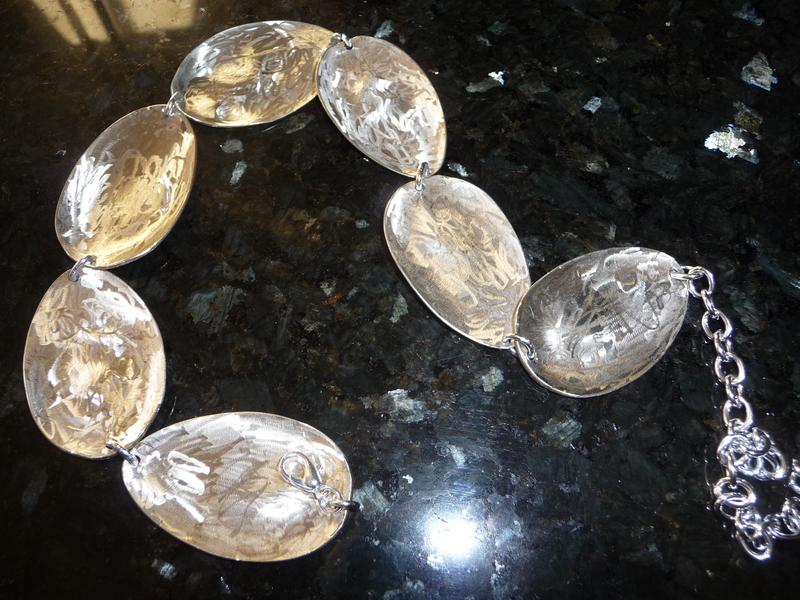 I saw this necklace made from spoons, their bowls hammered flat, and tried it on. The individual elements reminded me of abalone shells or weather-burnished fishing lures and of course I bought it. When I wear the spoons against my throat, will they tell me their stories? ~ by theresakishkan on October 25, 2014. Spoons! I love spoons, which are made to offer and nurture. What a beautiful creation, Theresa. This entry was posted on October 25, 2014 at 5:22 pm and is filed under Uncategorized.You can follow any responses to this entry through the RSS 2.0 feed.You can leave a response, or trackback from your own site.